Seemingly paradoxically, Western society is both discontent and complacent. We are surrounded by waves of unhappiness and perpetual reminds that we should want something more than what we’ve got, alongside similar messages that some things are better left unchanged or unconsidered. This paradox is exactly the reverse of what the Christian life should look like. We should perpetually be discontent with the presence of sin in our lives and the world, meanwhile we should be supremely satisfied with God’s provision for us. 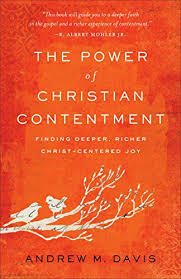 Andy Davis, Senior Pastor of First Baptist Church of Durham, promotes a positive vision of satisfaction in Christ in his recent book, The Power of Christian Contentment. Davis is a modern-day Puritan, meaning that word in the very best sense possible. He has read deeply in the Puritan tradition, and that influences how he preaches, what he writes about, and how he lives his life. Davis is, personally speaking, one of the more consistently cheerful Christians I have encountered because he generally forces his mind back to a positive focus on finding contentment in God’s goodness. This book is built on the general ideas presented in the classic Puritan work, The Rare Jewel of Christian Contentment, by pastor Jeremiah Burroughs. Davis does a great deal more than simply summarize Burroughs’s sermons, though, he shows the contemporary reader the Scriptural foundations of Christian contentment and points us toward the means to develop a more carefully content disposition in this life. The Power of Christian Contentment is divided into four parts. Part One points out the general discontentedness of our culture and shows the vision of contentedness that Paul presents as normative for Christians. In Part Two, Davis gives practical instructions for how to attain to Christian contentment. He begins with definitions, presents a vision for its application, and shows how Scripture, especially the life of Christ, reveal contentment. Part Three explains why Christian contentment is terrifically valuable, especially in our culture of wealth that is unlike any culture previously in existence. In the final section, Part Four, Davis shows that contentment is not complacency—it is not simply emptying the mind and heart of desire as some Eastern religions propose—and he also helps show how to protect the disposition of contentment in a world that is perpetually telling us that more, different, better, faster, higher, sexier, and newer is exactly what we need. All of Davis’s books are helpful, from his book on spiritual disciplines, An Infinite Journey, to his book on church revitalization. He is personally one of the most consistent Christians I have met, which is significant as we read his explanations about how we should live and grow as Christians. The ministry that has been established to collect his teaching, Two Journeys, is a gift for those seeking for consistent expository teaching built on the orthodox Christian tradition. One of the central elements of The Power of Christian Contentment is that our satisfaction in Christ is a primary tool for evangelism. Everyone is unhappy about something. Our political climate is entirely structured on creating unhappiness that only abolishing the other party can possibly fix. Economically, no matter how much we have, one side reminds us that someone else has more (which is unfair, they say) and the other side reminds us that some people are keeping us from getting more (also inherently unjust, in the eyes of some). Davis’s argument is that when we have Christ, we have everything we need. When we are satisfied in Christ’s provision, that shows and that satisfaction is attractive to the harried masses around us who are convinced that fewer social restrictions or a larger bank balance are the keys to eternal satisfaction. Davis’s general framework is that there are two infinite journeys toward Christlikeness. One journey is the external journey, which entails the outworkings of the gospel in life. Christians are, without question, called to fight injustice, feed the hungry, and care for the socially downtrodden. The second journey is the internal journey, which focuses on the continual progress in sanctification. Both journeys are essential aspects of the Christian life. This book unquestionably deals with the internal journey. It is focused on the very big problems that we are each having in our own hearts. Much of the social injustice in this world is, in fact, caused by widespread discontent that leads people to take advantage of others, seek personal gain over the common good, and fight against those that stand in a different place. We must engage in the process of pushing back the effects of the fall in the world around us, but if we do that to the neglect of personal sanctification, we will find that we will fail at both attaining personal holiness and social justice. The Power of Christian Contentment is an important book for our time, and likely for years to come. This is a volume that is vital for pastors, as they seek to exemplify holiness to their people. It is also a significant book that will benefit the average church-goer as they pursue life in Christ.